Average Weight	: 65 - 75 lbs. Bred to accompany their masters on the hunt, the American Foxhound is known for its stamina and shrewd nose. They were once used to chase and flush game while their masters remained on horseback ready to dispatch the fleeing beasts. Should they catch it, they very rarely maul their quarry in the course of a hunt, preferring the chase itself. Foxhounds were brought to the United States by Robert Brooke, as far back as 1650, and thus began the formation of the earliest collections of hunting dogs in the New World. These pedigree of these Foxhounds remained unbroken for over 300 years, with the Brooke family dogs being a distinctly separate line from other foxhounds, as recorded in the meticulously kept 'common stud book'. 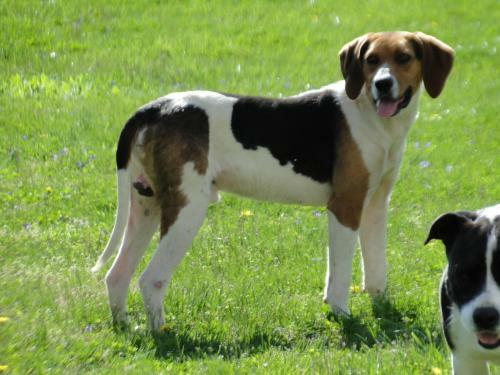 The American breed of Foxhound is distinctive in it's unique head shape and height to the inclusion of some traits from the taller French Hounds that were given to George Washington by the Marquis de Lafayette nearly a century after the first Foxhound arrived. The American Foxhound is a bit taller and thinner than it's English Foxhound cousin. Of course, all the Foxhounds are very closely related and share many common traits. In fact, other than size, they are very similar in appearance and temperment to the somewhat more familiar black, white and tan beagle. Foxhounds have been in Virginia for so long, the American Foxhound has actually been named the official state animal. •	Well tempered this is another breed that is great with children. •	Good Guard Dog. Will defend family pack. Their demeanor is cheerful and, as such, they make wonderful family dogs provided they have enough room to run around and expend some of their excess energy. They are also very pack oriented, and will readily call a human family its own and demanding daily affection. Like another well bred Hound, the Beagle, Foxhounds high energy and stamina, bridled, will make them appear to be a bit high strung as well as being vocal with their howls & 'yips' ~ which was an encouraged trait in the 'hunt'. When they do set up a howl, it is quite loud, though music to the ears of those who love hounds. Foxhounds aren't ones to lay around and bark without cause, like some hounds, preferring instead to actively seek the affection of others. They crave attention and are very affectionate in the home. They are actually quite good with children and can be trusted with even the smallest young ones. In fact, American Foxhounds are very social dogs that will fiercely defend their pack, human or not. As such, it can be difficult to retrain a dog to live with a human family if they've spent a lot of time in the company of a dog pack, such as is very commonly found in the case of hunting packs. It is the nature of Foxhounds to display nervousness around loud noises and situations where they're overwhelmed by scents and sounds ~ considering they were bred to operate at high levels of energy based on scents, sounds and noises in the 'hunt'. When exposed to high levels of energy & sound this breed can actually become frenzied ~ and left alone can result in some destructive behavour. American Foxhounds were bred & developed to have a high sense of smell, even more so than their other Hound cousines, and will follow a scent to the exclusion of all else, including your commands and pleas, especially if it's something good. Even a well-trained Foxhound is not easily called off a scent. It's not that they don't know what you want, it's just that they don't care right now. When hunting, they are essentially fearless and will do some stupidly brave things if you give them the chance. It is genearly not advised to let a fox hound off the leash unless you're sure there are no roads anywhere nearby and are in a position to get your hound out of trouble if they decide to take on a bear or something equally suicidal. Owners in town and the country need to be very careful that American Foxhounds don't run off. They're notoriously stupid about traffic, but clever enough to figure out how gates latch and, tall enough to do something about it. The American Foxhound is an unusually healthy dog. Generally, the breed doesn't Show any sign of congenital defect or inherited conditions. It is also usually free of debilitating hip and bone disorders that plague many other large breeds. The grooming regimen for American Foxhounds is very simple compared to most other breeds. The coat is coarse and smooth with very little extra hair to tangle up or catch things in the woods. So, unless the hound's coat is especially soft, you won't have to worry about picking seeds and leaves out of your companion's fur. While most American Foxhounds require a great deal of exercise in an effort to keep them sane, a careful grooming regimen should include regular checks on their toenails. Most foxhounds have white claws, making trimming a lot easier. If your dog has black nails, you'll have to be especially careful not to cut below the quick that is visible on white nails. Just about any type of exercise is suitable for this very active dog, though they are definitely at their best when running through the woods. The American Foxhound's long legs and natural agility allow it to cut through undergrowth faster than you might think possible. For hounds that don't have regular access to their preferred terrain, regular exercise in a yard or even frequent walks are an absolute must for a hound kept in the relative confinement of living in a house. Apartment dwellers would do better with another breed of dog, since the foxhound is prone to very serious bouts of misbehavour when bored. Though not typically a destructive breed, they are sure to wreck havoc on a typical household when left alone too long without exercise. Many people give them free access to an outdoor pen, but be forewarned: they are well known as escape artists. Their agile minds, "soft mouths" and tall cartridge allow them to pick even rather complicated locks. The American foxhound is a very intelligent breed, though not always responsive, even to the best of training. They are spirited and often described as jovial or happy dogs. Though not typically the sort of dog that just sets up to barking for hours non-stop, the American Foxhound is known for "giving voice" when conditions warrant it. Some owners, especially those that live in heavily urbanized areas, are able to achieve a certain amount of success with citronella (or any other scent they find offensive) spray collars that give them a little quirt every time they start up with their very distinctive howl and yip. Their social nature allows you to be in as much of a position of authority as any foxhound is willing to accept by always making sure you retain your position of dominance in your own family or "little pack." Many owners find their Foxhounds are very receptive to positive reinforcement. Generally they respond to punishment with what could best be called complete and utter confusion. They can be a bit difficult to house train. Owners who have even moderate success in this can congratulate themselves on a job well done, since the breed is so resistant to potty-training.